Bullhorn-wielding workers* paced up and down in front of the protesting crowd, all of whom were confined behind police issue metal barriers. A few officers hovered nearby, eyeing the workers warily. “New York Times, stop lying! We need an answer! New York Times, we need the truth! New York Times kills jobs!” they chanted. Days after Nir’s article hit newsstands, Governor Andrew Cuomo put together an unprecedented emergency task force intended “to prevent unlawful practices and unsafe working conditions in the nail salon industry.” Response to this measure was, on the one hand, overwhelmingly positive; it seemed like a testament to the power of journalism. However, protests such as the one held on Tuesday have been taking place regularly ever since; one held on September 21 reportedly attracted 500 people. The governor made good on his promise: in August, the state inspected 182 salons, 43 percent of which were found to not pay minimum wage or overtime. 87 percent neglected to provide employees with wage statements or pay stubs, and approximately three out of five nail salon employers admitted they did not maintain payroll records. On August 10, Cuomo announced that salons with two or more full-time employees must secure wage bonds before October 6 (the day of the Times protest), or else risk being shut down or fined. 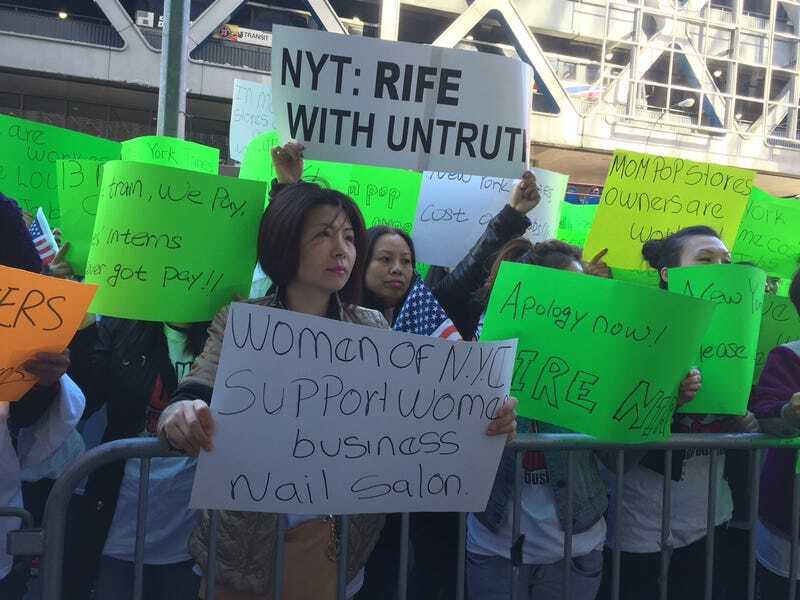 Though Cuomo’s task force was put together for the well-being of nail salon workers, the protestors seemed to see its effects as primarily negative: shutdowns, stigma, fines. Furthermore, no one was challenging the veracity of the task force’s findings outright: as their protest’s placement made clear, they seemed to take primary issue with the Times piece itself. Within Unvarnished, Nir shadows workers like 20-year-old first-time manicurist Jing Ren. Ren, newly arrived from China, becomes one of the many New York City women jumping into “cavalcades of battered Ford Econoline vans” for the trip to one of thousands of nail salons spread across three states. Ren, who appeared kind, hardworking and thoroughly exploited, was an utterly compelling protagonist. The reductive but essential nature of journalism—the fact that the stories of carefully selected individuals will be held up as representative of a universal truth—made her a powerful representative of a community that is often ignored in New York City. And yesterday, outside the intimidating fortress of glass and steel that houses the Times, other members of the same community told a conflicting story. Bernstein found the conclusions of the article to be overly sweeping and exaggerated, so he went about investigating its specific claims with his wife Zhongmei Li and sister-in-law Zhongqin Li. Bernstein wrote that he was not convinced that many of the advertisements referenced by Nir in her article as examples of “astonishingly low wages” could actually be found in Chinese newspapers. As for Mr. Bernstein’s contention that the lowest wage he was able to find in a classified ad was $70 a day, Ms. Nir and her team had a different experience. When examining newspapers from last year, prior to the editions perused by Mr. Bernstein and his wife, they found plenty of examples of salons advertising jobs paying well below minimum wage. One from June 19, 2014, in the World Journal, for example, showed a starting wage of $40 a day for “small job,” an industry term referring to how the worker fits in the hierarchy of jobs in a salon. (Ms. Nir and her team found that manicurists typically worked 10 or 11 hour days.) Another ad from July 17, 2014 in the World Journal also showed a $40 a day wage. And another one from April 17, 2014 showed a pay range of $40 to $90 a day. These examples were taken from a random sampling of days. When I spoke to Zhong Mei, she challenged this section of the Times rebuttal directly, saying that the newspaper had made a crucial mistranslation. “[The Times] pulled from June 2014 and they said that the advertisement said a starting wage of $40, but actually this was listing the price of manicures.” She told me that salon owners often list the price of services in advertisements for new hires. Doing so, she said, informs prospective employees whether or not the salon is high-end, in turn alerting them to how much they can expect to make in tips. Her pedicurist replied that she worked both the day and the night shifts; six days a week, she slept in a barracks above the salon. “When someone comes for a treatment at night, they shake me awake and I come down to do the treatment,” the woman explained to Nir. At the end of the week, she would return to her apartment in Flushing, Queens, to sleep for 24 hours before returning to work. That’s the moment that led to Nir’s eventual story, which covered not only labor exploitation but dire health hazards. The second part of the salon series, “Perfect Nails; Poisoned Workers,” describes cosmetologists suffering from cancer, abnormal fetal development, respiratory ailments; the list goes on. Re-reading the story, I was reminded of the woman who cuts my hair: on a whim, I went to a barber shop and showed the hairdresser a picture of Ruby Rose. While shaving the sides of my head, she told me that doing women’s hair was her true passion, but that she’d had to leave her old job because the cost of spending every day dying hair with noxious chemicals became too much. “I’d go home and try to go to sleep, but I couldn’t sleep because I couldn’t breathe,” she’d said, adding that she had constant, debilitating headaches. Nir has stood behind her story on social media, tweeting on August 25th that she wondered if nail salon workers were being paid during their so-called “strike.” On September 28th, a week after workers picketed outside of her office while she was on vacation, she still seemed unmoved by the campaign. When I called Nir on Wednesday morning to discuss the allegations made by the protestors, she was more tight-lipped. “I deeply respect the people’s right to express their opinion,” she said. *An earlier version of this story incorrectly stated that the workers were represented by the Korean American Nail Salon Association of New York and the Chinese Nail Salon Association of East America. The post has been updated with the correction.